The simulation demonstrates the analytic solution of the one dimensional diffusion equation. A delta pulse at the origin is set as the initial function. This setup approximately models the temperature increase in a thin, long wire that is heated at the origin by a short laser pulse. The analytic solution is a Gaussian spreading in time. Its integral is constant, which means that the laser pulse heating energy is conserved in the diffusion process. To avoid the singularity of the delta function at time t = 0 the calculation starts at t = 0.0001 sec with a Gaussian of corresponding narrowness. It is visible as a blue line before start. After Start the maximum amplitude (temperature) falls at a decreasing rate (observe the changing scale), while the width of the distribution grows correspondingly. Arrows indicate the 1/e width. Time t is counted in an number field in seconds. A slider defines the diffusion constant (heat conductivity) within a wide range. the analytic solution is a normalized Gaussian function. 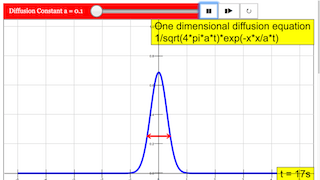 E1: Measure the time dependence of the maximum amplitude and draw its graph on log-linear paper. Choose an appropriate diffusion constant and consider the changing scale. E2: Do the same for the 1/e width of the distribution. Use a log-quadratic system for drawing, too. E3: Interpret your measurement by analysis of the Gaussian formula. Adjusting this will adjust the diffusion constant a. Double clicking anywhere in the panel will toggle full screen. Plays/Pauses, steps and resets the simulation respectively.